* This filter should be changed at least every 3 months. Certain conditions in your home will significantly add particles to the air - this will cause the filter to capture more particles, shortening it's life to less than 3 months. These conditions would include: dirty ductwork, pets, construction work, sanding projects, tobacco smoke, burning candles, fireplaces and wood-burning stoves. WHY USE MPR RATHER THAN MERV RATING? The Heating, Ventilating and Air Conditioning (HVAC) industry uses the ASHRAE 52.2 Standard, which assigns a Minimum Efficiency Reporting Value (MERV) to a filter. One part of MERV reports a filter's ability to capture medium to large particles between 1 and 10 microns. 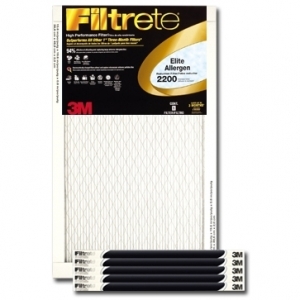 This value is helpful in comparing the performance of different filters but it is not adequate alone because particles greater than one micron make up only about 1% of the contaminants in your indoor air. Another part of MERV addresses submicron particles. 3M calls this the MPR or Microparticle Performance Rating. It measures a filter's ability to capture particles between 0.3 and 1.0 micron. Based on independent laboratory tests, 3M's MPR measures a filter's ability to capture submicron particles that make up 99% of the particles in the air, such as bacteria, smoke and smog.